Receive millions of NTY token to your wallet through the bounty of NextyPlatform! 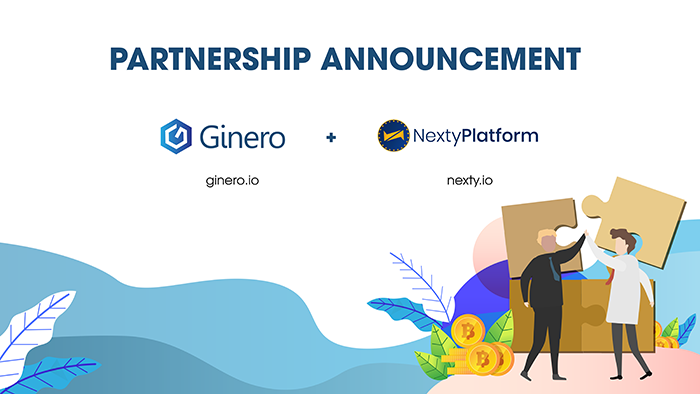 As we announced, NTY token of NextyPlatform - the next strategic partner of Ginero - will be listed on ginero.io in the end of 11/2018. Step 3: Pay for your order (buy) or confirm you have received the payment (sell). Rewarding time: 30 days from the campaign starting date. It means that 100,000 NTY which you have deposited will be temporarily locked during those 30 days. #Step2: Withdraw 100,000 NTY from Ginero.io to your Nexty wallet (available on itunes store, Play store). #Step 4: Enter the command /deposit to get a QR code from the Bot. It’s also the address that you need to deposit 100,000NTY to. Step 3: Comment about Nexty on Twitter, Bitcointalk, reddit, steemit. Step 5: Admins give thumbs-up for valid links. Thumbs-up will be recorded by Nexty Bot. In order to join Nexty Swat, participants must deposit at least 100,000 NTY .The deposit will be locked for 1 month and will be refunded when Nexty Swat program of that month ends Participants must have accounts on other Social network sites. Participants have already joint Swat reward Mission above and already get 10 thumbs-up from admins. What will Ginero support for this bounty? The prerequisite to join this event on 30/11/2018 is that you will need to deposit at least 100,000NTY on “Nexty Swat” campaign wallet. If you haven’t had the amount of coin as ordered,please access to ginero.io to buy right now (Note: trading pair NTY/VND will open when the campaign begins on 30/11/2018). For this event, Ginero will accompany with you by offer free trading until 10/12/2018, you can take part in bounty without paying a cent. Moreover, Ginero team will support you 24/7, so it you have any questions, feel free to contact us via our Vietnamese telegram channel.